Tugadh rabhadh d'Iar-Aire de chuid an DUP, Paul Givan, faoin tionchar a bheadh ag druidim na scéime Gaeilge Líofa sula ndearna sé an cinneadh é a dhúnadh, a léiríonn cáipéisí úra. D’ullmhaigh oifigeach sinsireach sa Roinn Pobal an páipéar treorach do Paul Givan a thug rabhadh dó nach mbeadh mórchuid na n-iarratasóirí, a bhí ina bpáistí ó chúlraí faoi mhíbhuntaiste, in ann íoc as na cúrsaí Gaeltachta samhraidh i nDún na nGall murach an scéim Líofa. Mhol an cháipéis fosta go laghdófaí méid na scéime chun druidim na scéime a sheachaint, ach sé lá i ndiaidh gur cuireadh isteach an tuairisc cúig leathanach dúradh i bhfoirm ríomhphoist: "minister has commented: 'no scheme' ". Dhá lá roimh an Nollaig, dheimhnigh Paul Givan go raibh sé ag cur deireadh le maoiniú na scéime sparánachta Gaeltachta Líofa a thug an deis do dhaoine faoi mhíbhuntaiste freastal ar chúrsaí samhraidh i nGaeltacht Dhún na nGall. Tar éis cáineadh mór, chuaigh Paul Givan ar ais ar a chinneadh beagnach trí seachtaine níos moille ag fógairt go raibh an maoiniú cuí aimsithe aige chun an scéim a choinneáil oscailte. 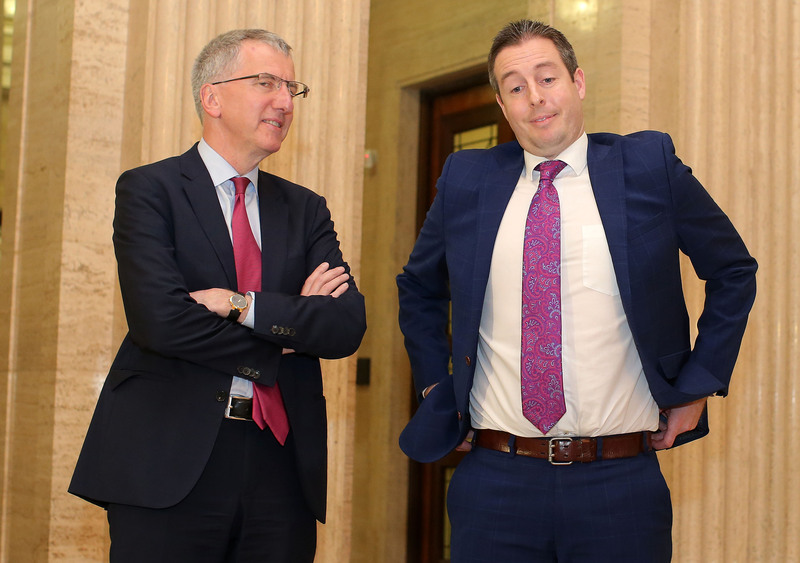 Iar-Aire Airgeadais Shinn Féin Máirtín Ó Muilleoir, ar clé, agus Iar-Aire Pobal DUP Paul Givan ag Stormont i ndiaidh don Leas-Chéad Aire, nach maireann, Martin McGuinness éirí as. Cuireadh an locht, go pointe, ar an chinneadh Líofa a dhruidim. Rinne Máirtín Ó Muilleoir Shinn Féin cur síos ar an achrann mar “bhuille maraithe na muice” i dtaca le héirí as an Leas-Chéad Aire Martin McGuinness, nach maireann, agus titim an Fheidhmeannais dá bharr. Anois is féidir le The Detail agus Meon Eile a léiriú gur moladh do Paul Givan 10 lá roimh dó an scéim a dhruidim go raibh “neart buntaistí ag baint le reáchtáil na scéime sparánachta Gaeltachta”. Dhiúltaigh an Roinn Pobal aon rud a rá faoin chomhfhreagras agus theip ar an DUP aon fhreagra a thabhairt air. Dheimhnigh an tIar-Aire Pobal Paul Givan go raibh an scéim druidte trí litir a sheoladh chuig coláistí Gaeltachta ach d’fhógair sé níos moille ar Twitter go raibh athchinneadh déanta aige an scéim a choinneáil oscailte. Leanann sceitheadh na gcáipéisí úra seo scéal níos luaithe i mbliana ag The Detail agus Meon Eile a léirigh gur theip ar an roinn measúnú comhionannais rialtais a dhéanamh faoi na himpleachtaí a bheadh ag dúnadh an chiste ar chur chun cinn deiseanna cothroma i dTuaisceart Éireann. 13 Nollaig 2016 atá luaite leis an cháipéis threorach aire agus cuireadh síos ann ar na míbhuntaistí a bheadh ann muna reáchtálfaí an scéim mar “the potential for negative media attention, and less young people and adults able to afford to attend the Gaeltacht to improve their Irish this year”. Léirigh sé fosta gur chuidigh an togra leis an Roinn coimitmintí ó Chlár an Rialtais a bhaint amach, ina measc “sochaí chruthaitheach a thógáil ina mbainfidh daoine a mbarr cumais amach”, “sochaí roinnte a aithníonn an éagsúlacht a chur chun cinn”, chomh maith lena chinntiú go mbeidh “an tús is fearr sa saol ag páistí agus daoine óga”. Chomh maith le trí choimitmint ó Chlár Rialtais an Fheidhmeannais a bhaint amach, dúirt an cháipéis gur chuidigh an scéim teanga sprioc rialtais a bhaint amach chun níos mó daoine a spreagadh feabhas a chur ar a gcuid Gaeilge. 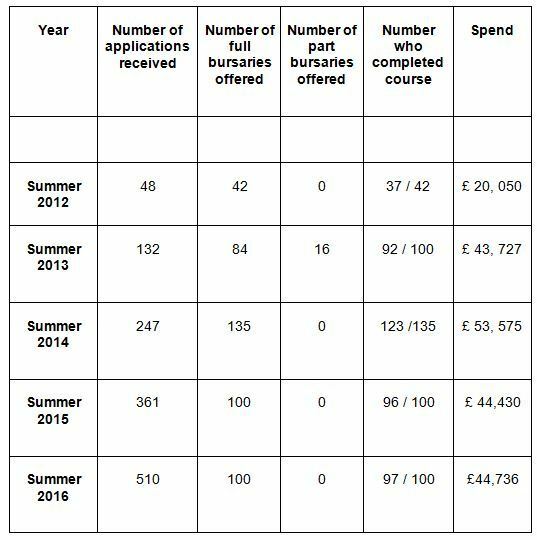 Deir an cháipéis fosta: “Without departmental funding the majority of the 96 students who completed the course [sa bhliain 2015] would not have been able to afford to take part in the scheme. Of the 100 successful applicants this year, 73 were in receipt of social security benefits, and 23 were receiving tax credits (in work benefits)." Léirigh an cháipéisíocht chomh maith gur moladh don aire go raibh an dara rogha ann an ciste a choinneáil oscailte ach an líon áiteanna ar an scéim a ghearradh siar ó 100 go 50 ar luach £27,000 in áit an £55,000 a cuireadh ar leataobh don scéim iomlán i mbliana. An ríomhphost, a fuarthas de barr reachtaíocht saoráil faisnéise, a seoladh chuig údar na treorach faoi Líofa ag cur ar an eolas í faoi chinneadh an Aire an scéim a dhruidim. D’eisigh an Roinn Pobal na cáipéisí úra díreach roimh dheireadh seachtaine na Cásca, Déardaoin 13 Aibreán, i ndiaidh don ghrúpa saoirsí sibhialta ‘The Committee on the Administration of Justice’ (CAJ) dúshlán a thabhairt ar an chinneadh roimhe sin cosc a chur ar fhoilsiú caipéisí bainteach leis an chinneadh Líofa a dhruidim. Dúirt Leas-Stiúrthóir an CAJ Daniel Holder le The Detail: "We are pleased we won the appeal and the information has now been released. The minister had invoked a Freedom of Information exemption relating to ‘free and frank exchanges of views’ with officials and the documents were originally withheld on this basis." “There is however nothing ‘free and frank’ about the sole official document the minister received. It’s a formal options paper setting out the background to the bursaries scheme." Ag caint faoi impleachtaí dhruidimna scéime, dúradh sa cháipéis treorach aire “there would be an impact on our progress towards getting 20,000 people signed up to Líofa – one of the criterion for application to the scheme is that the young person must be registered with Líofa and have pledged to improve their learning of Irish”. Dar le suíomh idirlín Líofa, tá níos mó ná 19,430 duine cláraithe leis an togra go dtí seo. Bhí an scéim deontais Ghaeltachta mar uirlis chun tacú le polasaí Líofa. Léirigh an comhfhreagras inmheánach a tugadh don CAJ méadú bliantúil ar líon na n-iarratas don scéim ó bunaíodh sa bhliain 2012 é, méadú 41% ó 361 in 2015 go 510 in 2016 san áireamh. Tábla de chuid na Roinne Pobal ag taispeáint líon na n-iarratas agus costais na scéime sparánachta Líofa ó bunaíodh é. Foinse: Roinn Pobal. An uasmhéid a chosain an cúrsa ná £53,575 sa bhliain 2014 nuair a tugadh deontas do 135 duine. Laghdaíodh go 100 deontas é an dá bhliain ina dhiaidh sin nuair a bhí costas bliantúil de timpeall £44,500 air. Aimsigh an scéal anseo ar The Detail.